"Perform the work of an evangelist"
To Evangelize the Catholic Faith by "Living the Gospel Life," in the spirit of Saint Francis and Saint Clare. Members of Our Lady's Promise Confraternity form a union with other faithful throughout the world who, along with their own intentions, include the intentions and needs of all its members, while they in turn pray for them. "Preach the Gospel always- and, if necessary, use words." Evangelize the Catholic Faith by, "Preaching the Gospel always, and if necessary, use words." Membership in the Confraternity does not bind failure to complete any of the obligations under the pain of sin. Members must have his/her name inscribed in the register of the Confraternity. There are no meetings and no dues. The special protection of the mother of God. A share in the prayer of countless thousands of members the world over, and this even after death! A share in the prayers, masses and apostolic works of the entire Franciscan family. The intercession of the entire heavenly court. Various plenary and partial indulgences. Free access to a special Members Only section of this website. A beautiful personalized PDF membership certificate suitable for framing. 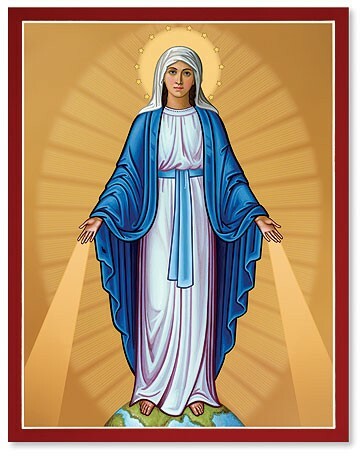 Monthly e-mail issues of the Our Lady's Promise newsletter is sent to those members who wish it. Its purpose is to provide sound doctrine and spiritual guidance for readers everywhere. 1. Whoever shall faithfully serve me by the recitation of the rosary shall receive signal graces. 3. The rosary shall be a powerful armor against hell; it will destroy vice, decrease sin and defeat heresies. 4. It will cause virtue and good works to flourish; it will obtain for souls the abundant mercy of God; it will withdraw the hearts of men from the love of the world and its vanities and will lift them to the desire of eternal things. Oh, that souls would sanctify themselves by this means! 6. Whoever shall recite the rosary devoutly, applying himself to the consideration of its sacred mysteries, shall never be conquered by misfortune. God will not chastise him in His justice, he shall not perish by an unprovided death; if he be just, he shall remain in the grace of God and become worthy of eternal life. 8. Those who are faithful to recite the rosary shall have during their life and at their death the light of God and the plenitude of His graces; at the moment of death, they shall participate in the merits of the saints in paradise. An indulgence is the cancellation of temporal punishment due for sin, when the sin's guilt has already been pardoned. An indulgence is partial if it frees the Christian partially from the temporal punishment due for his sins, plenary if it frees him wholly. Both partial and plenary indulgences can always be applied to the dead, but only by way of suffrage. Since the Apostolic Constitution of Pope Paul VI on Indulgences, a partial indulgence is no longer expressed in reference to time, i.e. days or years. A plenary indulgence can be gained only once a day, except by those on the threshold of death. To gain a plenary indulgence the person must perform the indulgenced act, and satisfy these conditions: Sacramental Confession, Holy Communion, prayer for the Pope's intention, and freedom from all attachment to sin, even venial sin. If this detachment is not present, or if any of the above conditions are not fulfilled, the indulgence is partial. On the following feast days: Christmas, Easter, Annunciation, Purification, Assumption, Our Lady of the Rosary, and Immaculate Conception. For those who pray the Rosary, a plenary indulgence is granted under the usual conditions, when the Rosary is prayed in Church, or in a Public Oratory, in a family (family Rosary), Religious Community, or Pious Association. Otherwise a partial indulgence is granted. 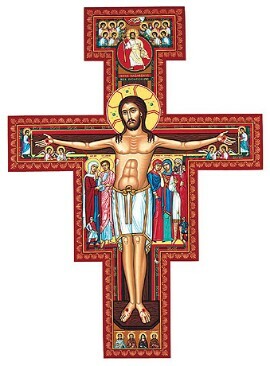 The San Damiano Crucifix pictured above is the crucifix of conversion. About the year 1205, Saint Francis of Assisi prayed repeatedly before this Crucifix, "Most High, Glorious God, enlighten the darkness of my mind, give me right faith, a firm hope and perfect charity, so that I may always and in all things act according to Your Holy Will. Amen." From this crucifix, the Holy Spirit gave Saint Francis his mission, "Go and repair My House which, as you can see, is falling into ruin." The Confraternity of Our Lady's Promise has made Francis' prayer and mission their own. The San Damiano Crucifix is the Confraternity's symbol.